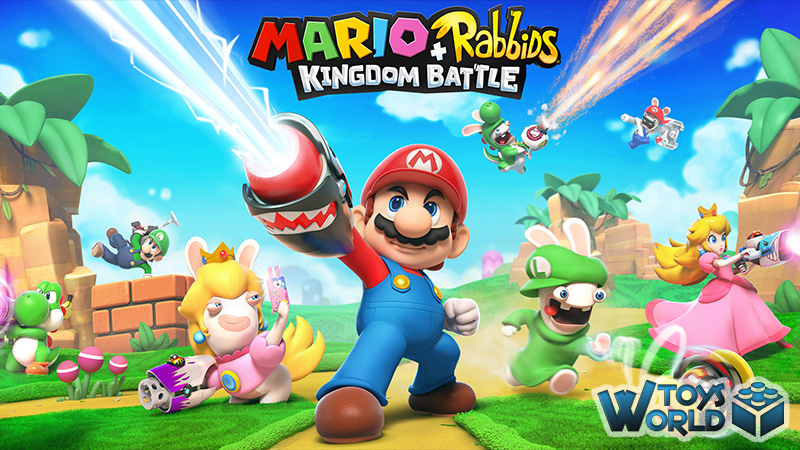 Join Mario, Luigi, Princess Peach, and Yoshi as they team up with their Rabbid counterparts to explore a new world twisted by the mischievous Rabbids, filled with secrets and nods to classic Mario games! Outwit unpredictable enemies in dynamic turn-based combat and co-op challenges, and solve puzzles along the way. Discover a feel-good and modern combat adventure designed exclusively for the Nintendo Switch system, playable anywhere, anytime, with anyone. 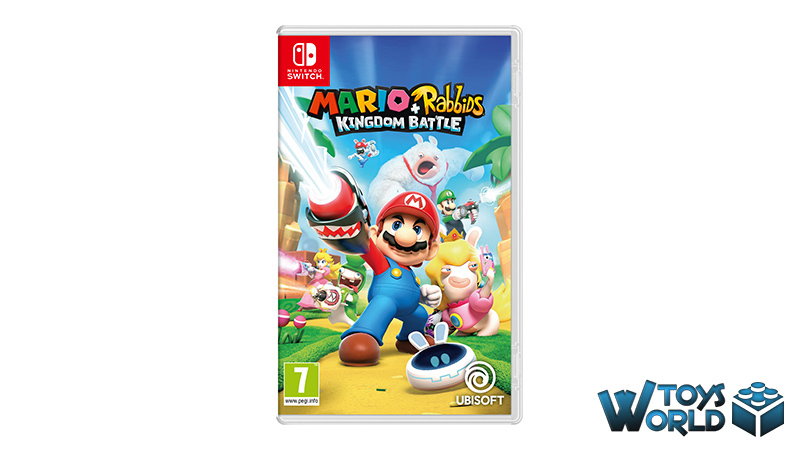 Whilst many of us were hoping that Mario’s first platform-based outing on the Nintendo Switch would be of a more traditional format, our curiosity for Mario + Rabbids Kingdom Battle was piqued ever since the title was first announced. What we have here is a mash-up; not just of two franchises, but of gameplay style. Mario + Rabbids Kingdom Battle fuses turn-based RPG gameplay with a platform, and it works surprisingly well! 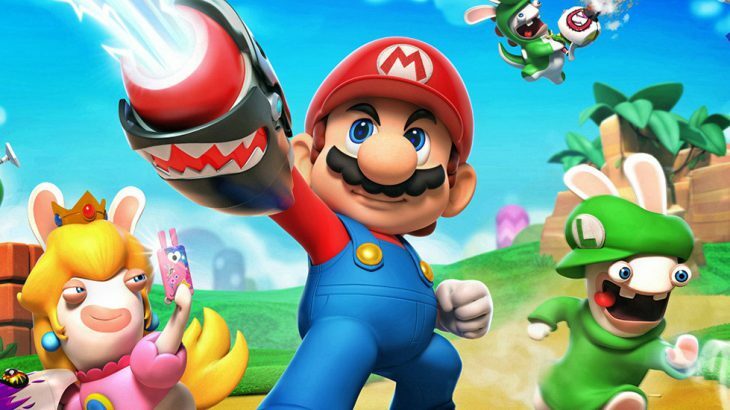 The background story to the game is a strange one; bear with us – Rabbids, using a time-travelling washing machine, find themselves in the office of a skilled inventor, who also happens to be a big fan of the Mario franchise. The inventor has made a VR headset that can merge objects together. One of the Rabbids puts the helmet on and everything it sees starts to merge, causing all manner of problems. 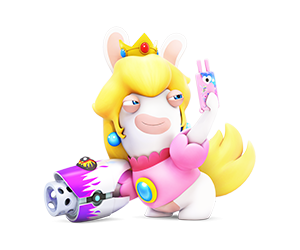 They are all transported (via the time-travelling washing machine) into a dimensional vortex with the other Rabbids and Beep-O – the inventor’s AI assistant. (Still with us?). 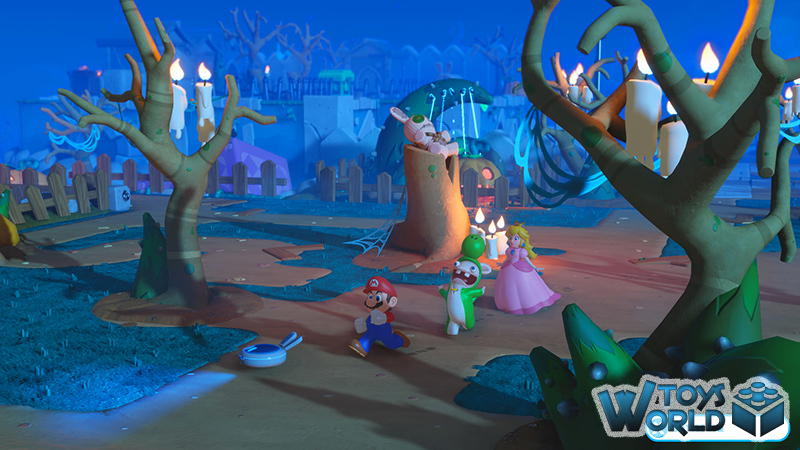 The vortex reopens in the Mushroom Kingdom and the Rabbids arrive, whilst Mario and Rabbid Princess and Rabbid Luigi start their quest to find the VR headset-wearing Rabbid and defeat the other Rabbids causing havoc across the kingdom. It’s a fairly odd and complex plot, and whilst, on paper, it shouldn’t really work, it does! 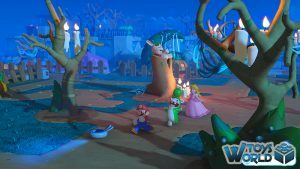 The clean UI makes it easy for kids and adults to follow, and the fact that things are split up between the RPG elements and the explorative Mushroom Kingdom, leads to a more enjoyable and diverse game. 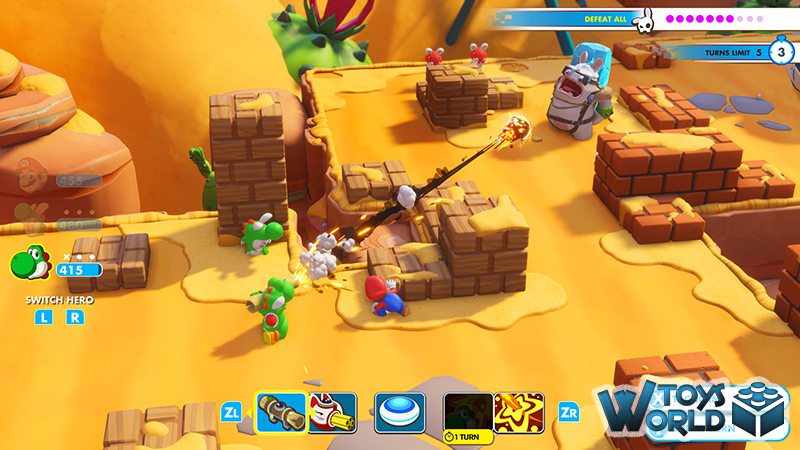 The more levels and rounds you unlock in the RPG gameplay, as well as coins you collect along the way, unlocks items and upgrades in the Mushroom Kingdom. As you unlock and collect items, you can improve player abilities, get upgraded weapons, and switch around your character team. 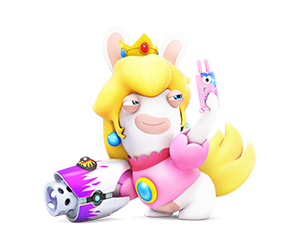 There are some great little puzzles scattered around, too, which, again, add variety to Mario + Rabbids. 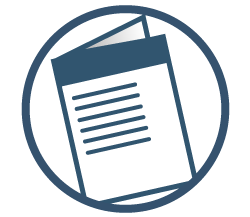 The RPG elements are fantastic, and you really have to think through your strategy, and even with the easy mode applied, it isn’t a simple walk in the park. 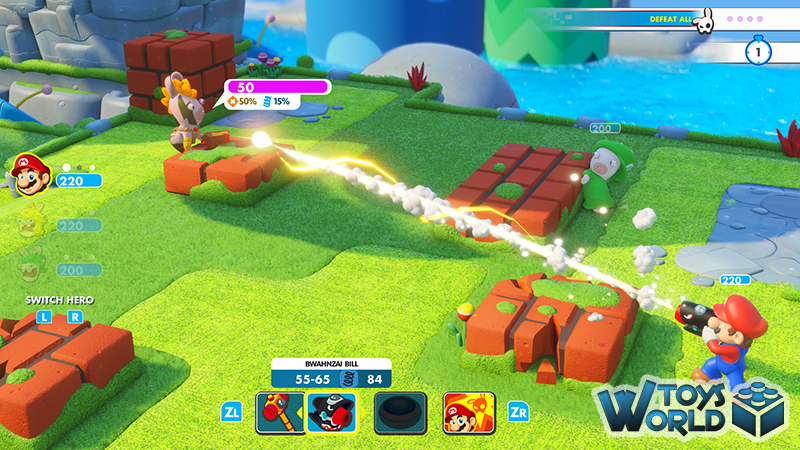 Within the tactics and options available to defeat the opponents, there are boxes which you can use to your advantage when attacking; for example, a box with a fire symbol allows you to push it towards the opponent. What we love though, is that the enemy can actually use these to harm you, too, so you really have to think about your position and tactics during gameplay. 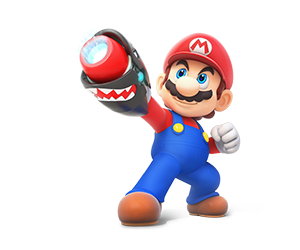 We only really had two little gripes in the game, and these are mainly focused on the Mushroom Kingdom sections; the first being that you cannot jump – something that every Mario platform game offers. That being said, there is no real need to as none of the elements you interact with require you to. 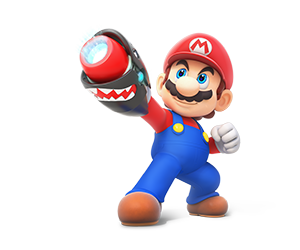 The other issue is that in Mushroom Kingdom mode, you cannot use the right-hand joy con to change your camera view, whereas in RPG mode, you can. It’s an odd decision, especially as it would be nice to see more of what is happening around you. 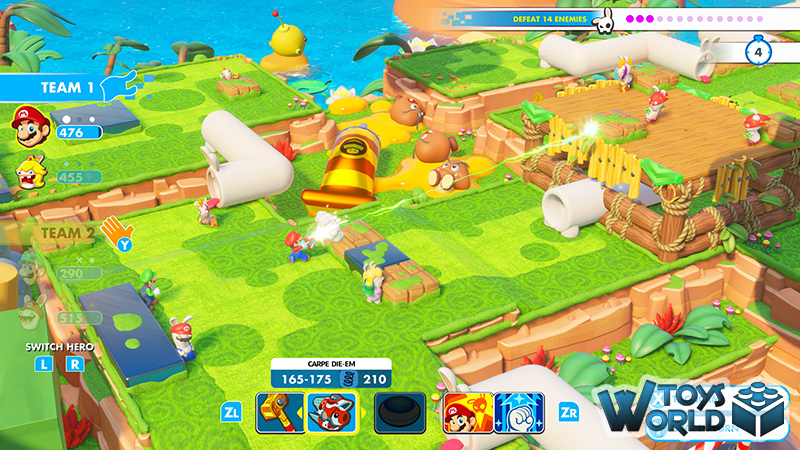 As for multiplayer, you can play additional co-op challenges with a friend in local multiplayer, sharing a pair of Joy-Con controllers or using Nintendo Switch Pro Controllers. 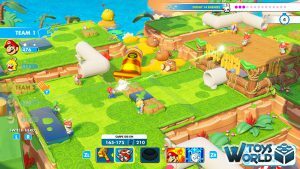 We were pleasantly surprised by Mario + Rabbids Kingdom Battle. This is a title that has taken the rules and turned them upside down and inside out. It’s clever, inventive and, more importantly, a whole lot of fun to play. + BUY Mario + Rabbids Kingdom Battle from Amazon.co.uk from just £44.00! + BUY Mario + Rabbids Kingdom Battle from Amazon.com from just $59.95! 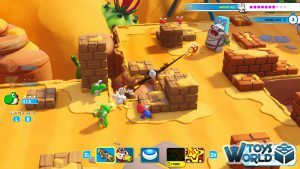 Video Games & Consoles Beep-O, Computer Game, Computer Games, Game, Games, Kingdom Battle, Luigi, Mario, Mario + Rabbids, Platform, Princess, Rabbids, RPG, Super Mario, Toad, Video Game. permalink.